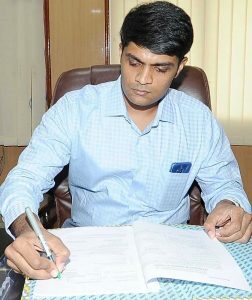 Thiru.Sandeep Nanduri, I.A.S., Collector of Thoothukudi District, belongs to the 2009 batch IAS of Tamilnadu Cadre. He is an Engineering graduate from Osmania University, Hyderabad and completed his MBA from Indian Institute of Management, Bangalore (IIMB). He first served as Assistant Collector (UT) at Virudhunagar district and after completion of his training was posted as Sub Collector Hosur, krishnagiri district. He has also served as Additional Collector (Dev)/ Project Director, District Rural Development agency, Salem and as Executive Director, Chennai Metro Water Board. He was posted as Corporation Commissioner of Madurai Corporation in 2016. He has joined as District Collector and District Magistrate of Tirunelveli District on 05.06.2017 F.N. Now Thiru. Sandeep Nanduri, I.A.S., has taken charge on 24.05.2018 F.N as District Collector and District Magistrate of Thoothukudi District.